Tremors with style- It's THE BURROWERS trailer! Not to be confused with the 1997 family romp The Borrowers, The Burrowers is a horror film by video game writer and Mimic 3 director J.T. Petty. 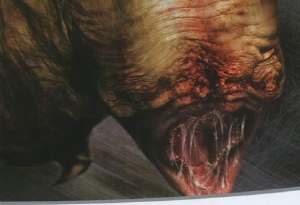 Imagine if Ravenous and Tremors came together and lost most of their satirical wit and you should begin to get an idea of what you can expected from The Burrowers. The international trailer for the film has just dropped over at BD and though it doesn't give much away in terms of monster mayhem, it definitely left me wanting more. If its a hit, I think there's every possibility that we could have another underground alien franchise on our hands people. Full synopsis and trailer after the break. The Burrowers tells the story of Coffey, an Irish immigrant wants the hand of MaryAnne in marriage. One night her familyâ€™s isolated ranch is attacked. But by who? Or what? All that is left in her homestead are the bodies of her family and she is nowhere to be found. Coffey sets out with a pair of aging Indian-fighters [Clancy Brown and William Mapother], a teenage boy and an ex-slave to find his beloved MaryAnne. Expecting the offenders to be a band of fierce natives, the group prepares for a routine battle. But they soon discover that the real enemy stalks them from below and they must unravel the mystery, â€˜Who are the Burrowersâ€™? This one looks freakin' awesome!! I'm dying to see it!! However, I couldn't make out too much from that trailer. Are they humanoids or bigger? ?